Northern China’s Hebei Province released a report on on July 23 showing that over 17 million residents there drink unsafe water, with over 5.7 million drinking water high in fluoride and brackish water. Prolonged, excessive exposure to fluoride by drinking high fluoride water can cause fluorosis that damages people teeth and bones such as crippling deformities of the spine and major joints. Hebei is not the only province with a high level of fluoride in drinking water. Except for Shanghai and far southeastern Hainan Province, all other mainland provinces, cities, and districts have found fluorosis in different degrees of prevalence, according to the Ministry of Water Resources. The Hebei report says increased heavy metals, including mercury, cadmium, and chromium, are from industrial wastewater, and the polluted water has started to spread from the surface to deep underground water. Household waste in the rural areas also contributes to the deteriorating water quality. A large amount of household garbage has been dumped in rivers, and animal and human excrement are dumped into rivers without processing. Seven major river systems in the province are moderately polluted. Hebei, which rings Beijing, is one of the most populated provinces in China with 73 million residents. Over 280 million residents in China use unsafe drinking water, and 110 million residents are located in the vicinity of highly polluting factories, China’s Ministry of Environmental Protection says in a report based on its first nationwide large-scale research effort, published this March. Water pollution scandals have frequently burst out in mainland China in recent years. This April, a water contamination accident in Lanzhou City, capital of northwestern China’s Gansu Province, triggered panic and a rush for bottled water in the city. Benzene levels in the city’s water were found to reach 200 micrograms per litre—20 times the national safety standard—the Chinese press says. The water supply facilities that ran through an area contaminated by a petrochemical plant broke, which led to the incident. Perhaps the most visible signs of water pollution in China have been large die offs of fish and the appearance in rivers of dead pigs. In the most severe incident involving pigs, 10,395 dead pigs were taken out of the Huangpu River in Shanghai last March. The pigs died due to a sudden temperature drop. Many farmers dumped them in the river to save money because they judged burying and cremation costs to be too high, state-media said. In this July, China’s National Development and Reform Commission has issued water pollution control projects to over 20 provinces with a total investment of 29.64 billion yuan (US$4.9 billion), according to state news media. 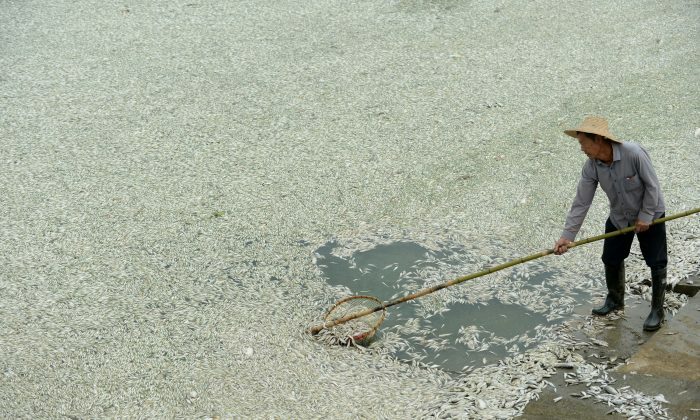 Money alone cannot fix China’s massive water pollution problem. Benzene, a petrochemical which causes cancer, was found far in excess of safe levels in the Chinese city of Lanzhou, causing panic.